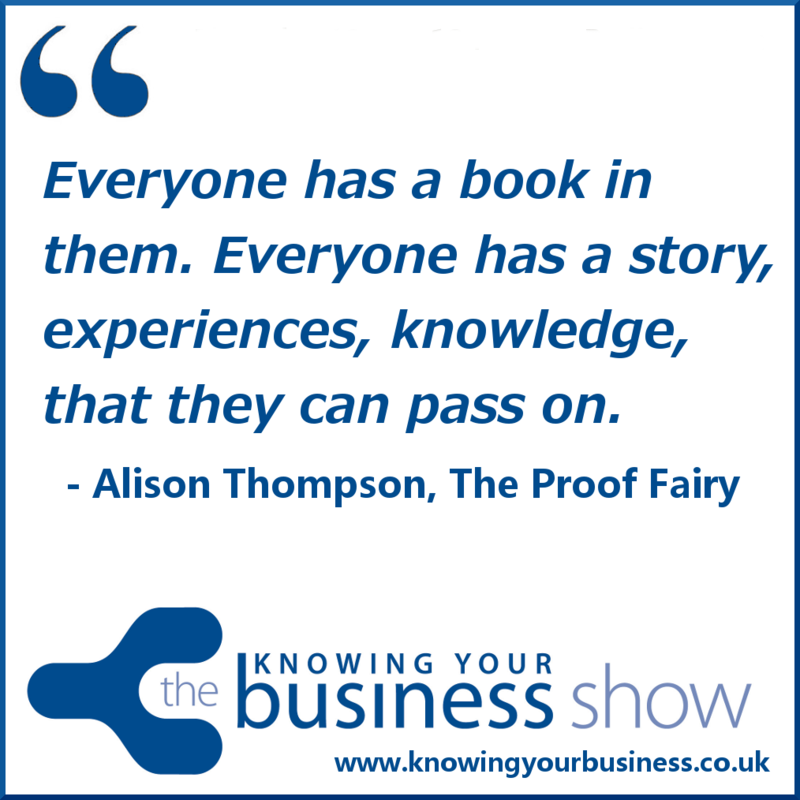 Interview with Alison Thompson the Proof Fairy on how she is helping people just like you take your book from possibility, to plan, to publication. The show topic was all about New Year’s resolutions. We asked Alison how can someone transform that New Year resolution of writing a book, into the exciting stage of reality. Alison suggests it’s really not that difficult. This interview was broadcast on Radio Horton 27th November. Podcast now available of this thought-provoking interview further down the page. In the meantime, enjoy the benefits of these hot tips that Alison has sent in to complement the radio interview. NOT to make lots of money! Yes, you can research any topic– but you may get so bogged down in the research you never get further than the title! No more staring at a blank page – it’s much easier to write when you have a well formed plan and know what’s coming in every chapter. Set yourself a goal and stick to it – whether that’s 500 words each morning, an hour a day or every Tuesday afternoon. It’s amazing how quickly the words add up! Let people know what you’re doing so they can cheer you on and keep you motivated. If you’re really brave, set an achievable launch date. Technology means anyone can be a published author – but don’t cut corners. Pay for professional proofreading and cover design – those are things you can’t do yourself. Your book will be competing with millions of others – use social media, blogging, local radio, specialist magazines, promotions and word of mouth to let the world know about your book. 8. Start planning the next book! Anyone can write one book …. be one of the rare few who publishes a series! In this 1:18 second snippet Alison brings it home perfectly on what holds people back from writing a book. The question is – are there any books written by you? The publishing landscape has changed. We hear how much easier the whole process has become in this 2 minute clip. As a child Alison wanted to be a radio producer but deafness in one ear thwarted that particular dream. However, she has concentrated her career in the media industry and now helps aspiring authors to take their idea for a book from possibility to plan to publication as The Proof Fairy. Been in business five years. Initially ran a local magazine but branched out into proofreading so she had something more global to talk about at networking meetings. That has expanded into proofreading, editing, copywriting, newsletter and website design and maintenance. Alison does a lot of work for authors, editing their manuscripts. However, not content with editing other people’s books, in March 2013 Alison wrote and self-published her own book. The Boy from Hell: Life with a Child with ADHD explores the first fifteen years of her son’s life, from his diagnosis with ADHD through diet and medication to school exclusions, brushes with the law and social issues. In 2014 Alison qualified as an NLP practitioner and coach with the UK College of Personal Development and founded ADHD Kids. Through this new company, she now offers one to one and group coaching for parents of children with ADHD. Alison also organises workshops, training and events such as the ADHD Inspiration Day. She is on a mission to raise awareness of ADHD and dispel the myth that it doesn’t exist! One of the services Alison offers is helping people to write and self-publish books. Many people dream of becoming a published author but they often don’t know how to get started, where to find the time or what to write about. Alison coaches people to find a topic, plan the content and get the book written – and then take over the technical bits like editing, formatting, designing a cover and uploading their book to s self-publishing platform. New Year is often a time when people assess their goals – and writing a book is one of those dreams that is more achievable now than ever before. Writing a book is also really useful for anyone in business, as it positions them as an expert in their field and can lead to all sorts of exciting opportunities and new directions. 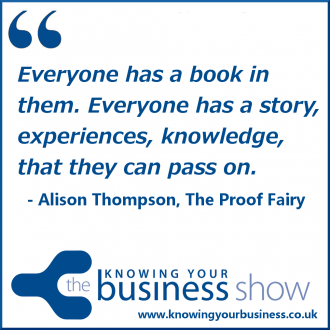 This week the Knowing Your Business show was presented by Ian Gentles and Trevor Ray. Trevor Ray has worked in sales and marketing positions within small and medium businesses ever since gaining his PhD in molecular biology 18 years ago. Trevor enjoys keeping fit and has completed a number of challenges to raise money for charity including cycling from Land’s End to John O’Groats. He has also completed a marathon and a number of triathlons although still really can’t see why people voluntarily get into cold water! It is also rumoured that Trevor is an enthusiastic albeit very amateur tap dancer. The Knowing Your Business Radio Show time is every Thursday from 10 am until 12 noon on Radio Horton. If you have any questions for Alison, or would just like to leave a comment, please do.